WelCom March 2018: At St Anthony’s School, Seatoun on 6 December last year, Cardinal John Dew blessed and opened an earthquake strengthened and completely refurbished senior school block. Named ‘He Atawhai’ (Kindness and Mercy) the block is the result of the old parish hall being converted as part of the project. It is now a modern learning environment with two large classrooms for years 5–8 students, that can be opened to create a large single space. 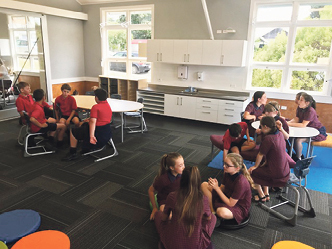 ‘We are excited about the many and personalised learning opportunities on offer for our students in our new flexible modern learning environment,’ says principal Jennifer Ioannou. He Atawhai features modern acoustic panelling, lighting, and the flexibility for spaces to be configured according to teaching needs. There is also a breakout room with smart TV to which students can connect their laptops to show their work onscreen. There is access outside to a private courtyard, two wet areas and storage space and whiteboards. New furniture offers a range of ways for students to work – standing at high tables, creating work groups with low tables jig-sawed together, or sitting on ‘lily-pads’. 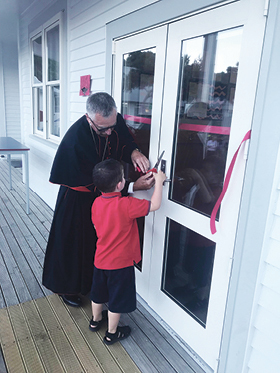 A new wooden cross on the outside of the building – a koha from Carroll’s Joinery and JWT Construction – signifies ‘Kindness and Mercy’.